Angels' Crossing Backpack Drive a Back-to-School Success! 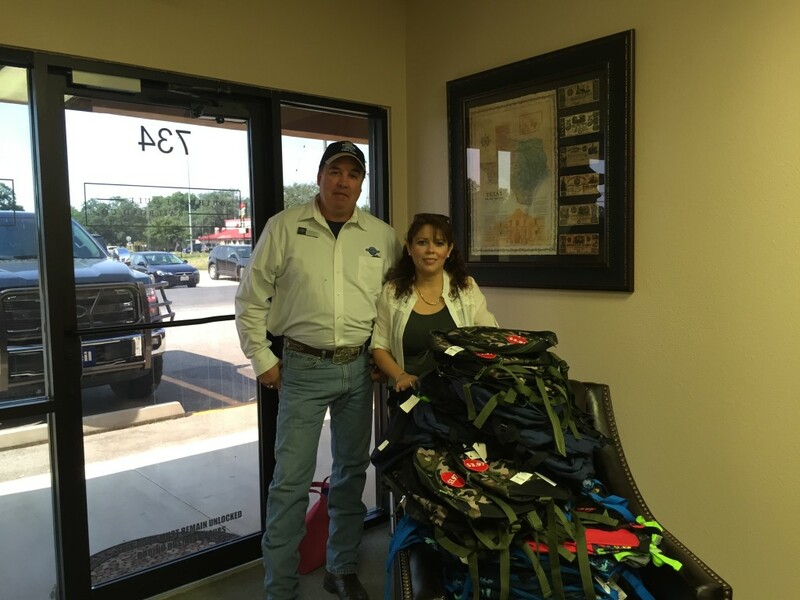 Scott Barlow of Cecil Atkission Ford and Soledad Najera of Pepe’s Pizza getting ready to distribute the backpacks to local foster children at the SGRR office. This July, Southwest Gulf Railroad Company partnered with Angels’ Crossing for the organization’s annual Backpack Drive, benefiting area foster schoolchildren. With the goal of 180 backpacks donated, we’re proud to say we exceeded our goal — including school supplies to place in each backpack. On August 1, we celebrated with a pizza party with all of our sponsors, where we distributed the backpacks to the grateful children! Thanks to all who helped us achieve our goal, especially: Cecil Atkission Ford; Pepe’s Pizza; the Hondo/D’Hanis Rotary Club; Castroville Lions Club; Wash Me Car Salon; and Shear Reflections. Kudos also to those who served as stations for donation drop, including Community National Bank, Hondo Public Library, Castroville Public Library, Chandler Automotive, Dollar General and Wommack Chevrolet.